No Blues: Doctor's Orders Gift Box. This creative gift is sure to put a smile on the face of your sick loved one or friend. This box comes in medium or large. Heat sensitive items are substituted during the summer months. Medium Box: Dr's Orders Theme Bag w/ chocolate mints, Gummi Aid Band Aides,Get Well Pills, Word Search, White Cheddar popcorn,Butter Toffee Pretzels,Cherry Sours, Get well Fortune Cookies, and Get Well roll candies. 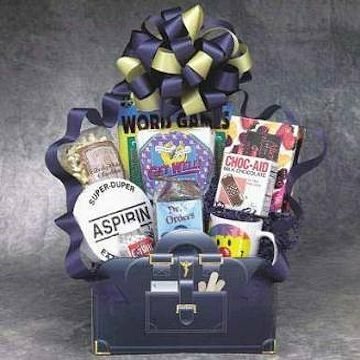 Large Box (shown): Dr's Orders Theme Bag w/ chocolate mints, Gummi Aid Band Aides, Get Well Pills, Word Search, White Cheddar popcorn, Butter Toffee Pretzels,Cherry Sours, Get well Fortune Cookies, Get Well roll candies, Smiley mug, Giant Aspirin, and Too Pooped to Pop Popcorn.